The DUAL MAGNUM Special Local Needs (SLN) herbicide: EPA No. 100-816/SLN No. NY-110004; a.i. metolachlor; Syngenta), label has expanded. Added Brussels sprouts (transplanted), cauliflower (transplanted), lettuce (head and leaf) and summer squash. Note that previous Dual Magnum SLN labels NY-090004 (pre-harvest intervals for tomatoes) and NY-050001 (use on asparagus, transplanted bell pepper, cabbage, carrots, garden beets, dry bulb and green onions, spinach, Swiss chard, pumpkins and winter squash) are rolled into this new label along with broccoli (direct seeded and transplanted), melon crop subgroup 9a (cantaloupe, muskmelon and watermelon), cucumber, garlic and leafy brassica greens crop subgroup 5b. Note, all these uses require signing a waiver/indemnification. 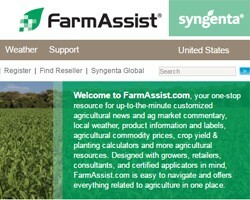 Go to the Farm Assist website. If you are a first time user, register as a new user. Complete the registration information and click on the "I Accept" button. Once into the site, look on the upper left side of the screen and select Products. Select Indemnified Labels. A detailed instruction sheet is provided below with screenshots of the Farm Assist website.